This whole blog is a work in progress right now but in a year or so I hope that the recipes section will include a comprehensive set of tasty, healthy, and sustainable meals for kids of all ages–ones that have worked well raising our own son. Plus I’m sure the occasional rant about toxic food, foods to avoid, and so on, will creep in too. First, and most importantly: DON’T START WITH POWDERED RICE CEREAL. Start with mashed sweet potatoes. 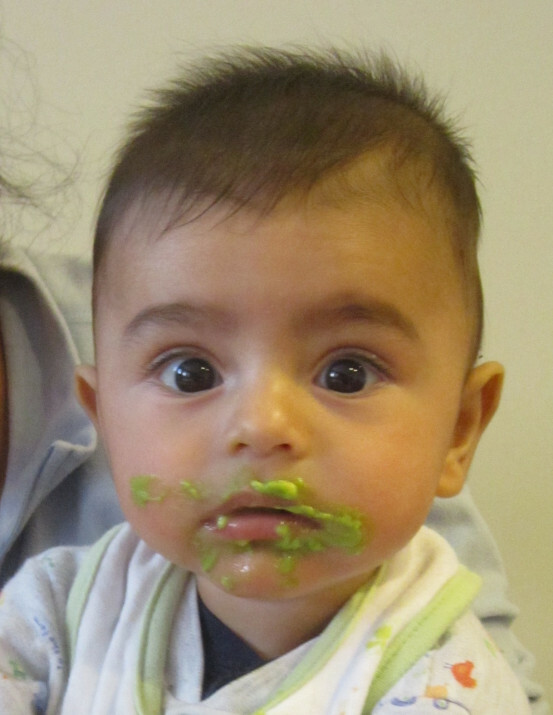 Ayhan trying mashed peas for the first time. Add in other vegetables and pureed grains, one at a time gradually. Over the months, the pureeing can switch to simple hand mashing or with grains just overcooking somewhat. Here’s a list of what we added in during the first 6 months of life–sort of in order though I can’t remember the exact order. And the list goes on. Mostly just lots of vegetables, whole grains, fruits, and a small serving of meat now and again. All mixed in a variety of combinations to make sure he got a good varied mix every day. 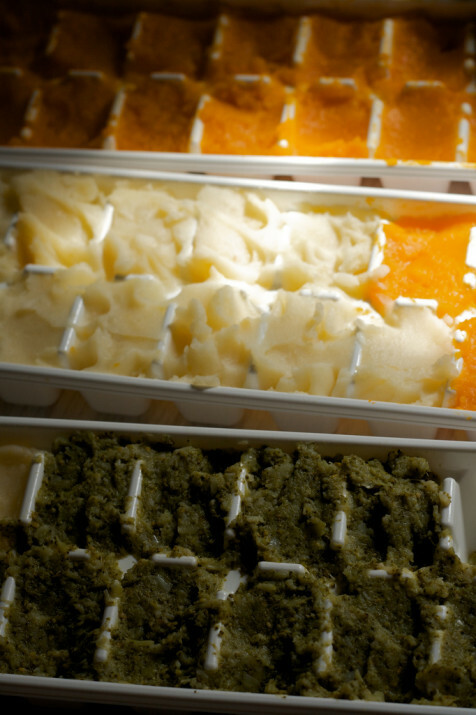 By making these in batches and freezing them in ice cube trays, you have a ready supply of a variety of foods every day. Notice, there is no refined sugar on this list at all. Ayhan didn’t try any sugar until he was 13 months (he tried a pancake that had syrup on it when we were camping). But other than that he still hasn’t had any sugar at 15 months. And we hope to keep it that way until at least 2-years old. As the WHO notes, the amount of added sugar in the diet necessary is zero. So why give a baby any sugar when he doesn’t even know what he’s missing? Soon enough I imagine that’ll be a battle we’ll have to fight, but keeping his palate free of super-sweet foods early hopefully will keep him less interested in sweets when we do introduce them. At around 10 months or so we started introducing more complex foods, things he had to chew, and giving him more food from our plates. Now at 15 months it’s rare that he’ll eat the baby food we still have in our freezer and we’re not making much more baby food at this point (just cooked apples and pureed prunes). And one last point: Goldfish and Cheerios have never entered the body of my son, and I hope to keep it that way long into the future. We feed him well so he doesn’t need to ‘snack’ on the playground (what a strange American custom that is).